Bed and Breakfast Molenblick is situated directly on the beautiful nature with the Windmills of Kinderdijk. You look out on the park with a 19-numerous mills between water and reeds. Here you will find promotional products peace and relaxation. We look forward to your visit and will do everything to make the stay in our Bed and Breakfast memorable. 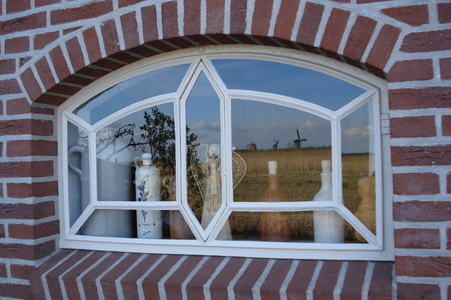 Bed and Breakfast Molenblick is situated directly on the beautiful nature with the Windmills of Kinderdijk. You look out on the park with a 19-numerous mills between water and reeds. Here you will find peace and relaxation. There may be fine walking and cycling. Also sailing with a boat and fishing are possible. Of course, a visit to the windmills of Kinderdijk on your program, with a look into the opened and authentically furnished "visitors mill". In the surrounding area there are beautiful hiking and cycling. There may be from here by Fast Ferry several trips to Rotterdam and Dordrecht (the oldest town of Holland) are made. These cities are worth a visit. There are several restaurants within walking distance Kinderdijk. There is also a bus stop nearby, so you can use public transportation. With a stay for two nights or longer you will receive a discount of € 5,00 per night. - Arrival: Monday / Friday from 17:00 pm, Saturday and Sunday from 16:00 pm or by arrangement. - Departure: Between 10:00 am and 10:30 am. - Bathroom with bath / shower and toilet. - Wireless internet is available free of charge in our accommodation. - The cozy lounge and the terrace on the water may be used. © 2016 Molenblick.nl. All rights reserved.